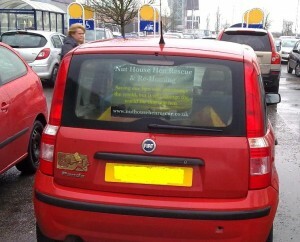 Look what I found in a car park a few weeks ago, it was before my world turned white. This entry was posted in Uncategorized on April 1, 2013 by Grannymar. People who look out for animals . . . ROCK! Thanks for sharing this great sign, Grannymar. I had never imagined, good for them. You can’t post stuff on your rear window here in Hawaii. You would be ticketed. Nevertheless, cute post. nrhatch – At first I found the sign amusing, then I read the details. Celia – Saving hens? It was a first for me. WWW – I thought so. gigi – I am not sure that it is legal here either. I would find it distracting every time I glanced in the rear view mirror. Brighid – Yes I have noticed the signs about dogs not just being a gift for Christmas, but for a lifetime. 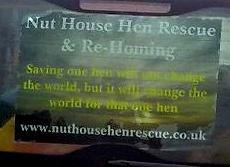 I’m not familiar with “nut house hen”. Is that a real chicken or does it mean something else? 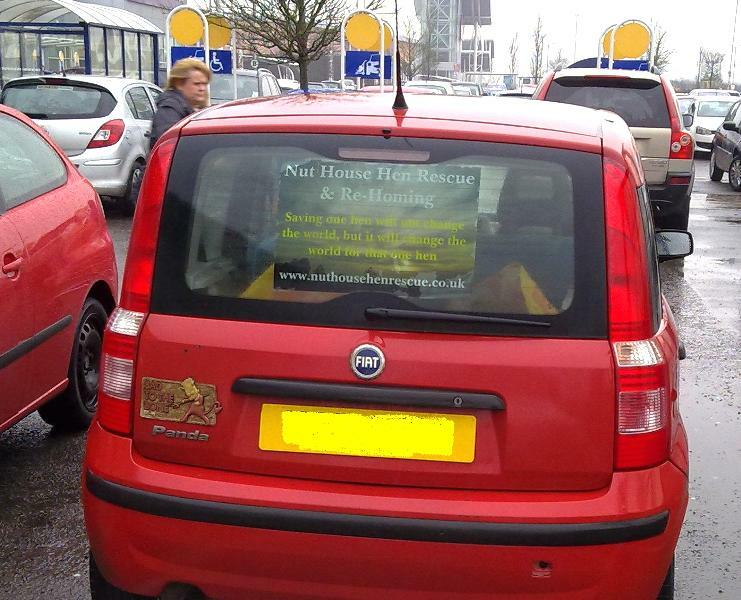 Alice – Nut House Hen Rescue is a voluntary organisation that rescues battery hens and tries to give them a more normal life, to finish out their days.